How many of you are tuning for a certain et? I'm shooting for somewhere in the 10s with my Capri but haven't decided yet. Ran it at 10.75s Wed nite but thinking of going a little quicker, (I have the throttle stop unhooked). Be nice to have several of us in the same ballpark. Whatcha think? I would just run it all out as the name suggests, If people start playing too many games they will get tossed I saw it happen when we did this in Vegas. Racers have to remember this is a TV game show basically where 16 lucky ones get to race for dough, 8 0f the 450 will take something home. Pretty much think of it as going to a car show where you get to see some real nice cars go down the track instead of sitting on a lawn all day waiting for a trophy at the end of the day. 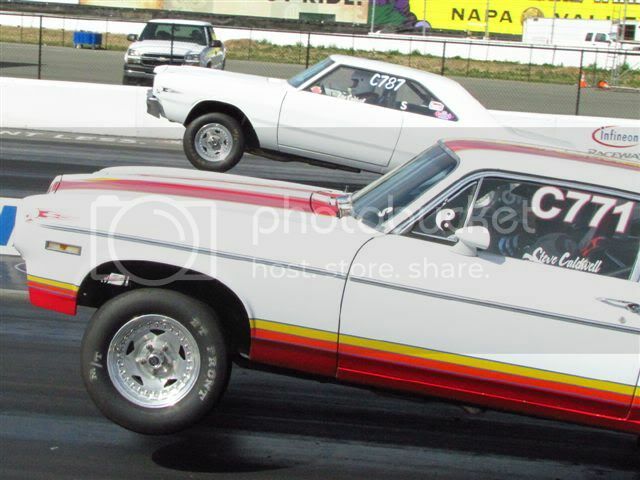 Rich Nedbal will be driving my 68' rr he went 10.727,10.737 and a 10.741 on wed. night so depending on weather he will be 10.60 -10.70, My Challenger will have the 9.20 range covered. Hopefully there will be 15 other cars running about the same. I think the 11 second cars are due for an episode. ...just remember...they ran a 12.50 class in Tuscon! Keith, good points about the playing games, I don't intend to do that. Just like Scott mentioned, launch rpm & shift points. My last three runs Wed nite were 10.753, 10.754, 10.753. I'm going to raise the launch & the shift points some to see what happens Wed nite, then I'll make a choice on what to use Fri-Sat. I don't really expect to be fortunate enough to hit the 16 but it will be fun, at least we'll have someone we know to cheer for I'm sure. 10.75 one pass, and 10.59 another....that gap alone might be enough to take you out of one ET field, and in to another. Imagine how bummed you'ld be if you "aimed" for a particular ET, and they chose an ET to race 16 cars out of, that you *would have* been in, had you left it alone. I see it as 2 time runs for $35...with a whole lot of other entertainment going on...it's a social thing for me...if for some lucky reason they like the ET, cars, people, show that 15 others put on because of what I am running, I'll feel lucky. 1)the staff of this show may be reading every word we type-they do their homework/research folks. 2)you never know...sometimes I wonder if they have MORE than 16 cars in the same range, but chose the 16 they "like"...you always hear them say "outstanding diverse group of racers and cars"...that shouldnt matter...if they had 16 cars all within 1/10th, who cares, right? wrong...it's a TV show....remember the old saying "that's showbiz"
just enjoy the show...and be happy for who they pick...dont go expecting a chance...go expecting to have fun and know that some lucky people will win with a nice hefty prize..
Don't mean to hijack this thread... Hey Peanut, since it's a "TV show", and they're looking for flash, would you like to borrow some magnetic flames for your pickup? Sure, they're cheesy, but I used to run them on a white truck at the Finals, so they'd be right at home on your S-10. I figure anything I can do to make the mid 11-second range cars more appealing to the TV guys helps me too. I think fuel is 7.99 a gallon now!!!! Scott...we stuck a set on the truck a while back that a friend had, and we actually prefer to "plain" look...hopefully the fuscia-pink pearl clear coat will "pop" in the sunlight enough to catch their attention...after all...it is "pink". I know when the show first started, they LOVED trucks...now it seems the S-10's are getting very common again...I think a S-10 won the New Orleans race.